Giverny is a bright, cheery, clean, cool blue. It is near the greener range of blues, without any red in it. 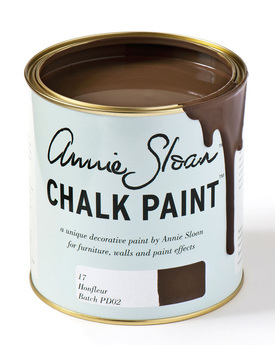 It is a perfect colour for a modern contemporary palette, and looks great with bright, warm colours and cool neutrals as well as greens from the Annie Sloan range. Giverny is named after the village in Northern France where Claude Monet lived. This strong, deep green takes inspiration from the painted shutters and doors of Amsterdam. It works particularly well with whites and creams and botanical imagery and plants. It also makes a great backdrop to cool blues, such as Provence, Giverny and the purple tones of Emile. Named after the harbour town in Normandy, Honfleur is a colour inspired by the rich warm browns found in the rustic French countryside as well as in Mid-century Modern design. This rich brown is just what you need to work with bright colours: it looks great next to Scandinavian Pink, Barcelona Orange, Giverny, Provence, Greek Blue and Antibes Green. 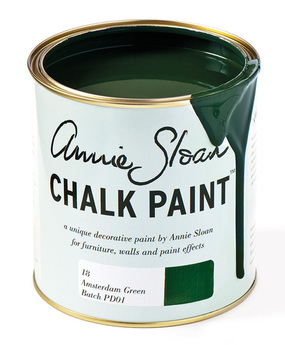 In this lesson you will learn all the tricks to achieve a great result with Chalk Paint. Here we go with the sophisticated techniques and endless creative possibilities. 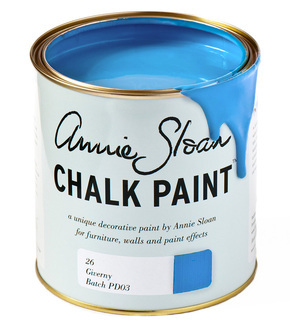 You know Chalk Paint™? You don't have any special questions? You know what colors you want? Then you can order and pay online. IF NOT: COME ALONG, we are here for you! click on the logo above or visit www chalkpaintonline.be. After payment we can send your package immediately. So, the next day it can be with you! Or you can come and collect it. You can pay directly via the website by card, easy. We can immediately send your package.